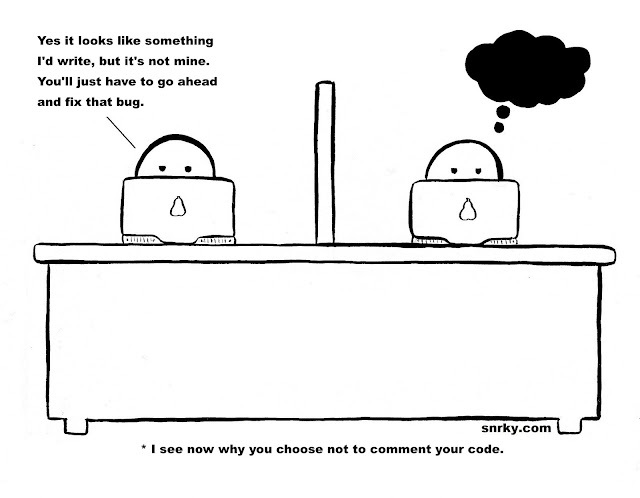 Snrky: I see now why you choose not to comment your code. I see now why you choose not to comment your code. It is both a blessing and a curse when you find that your team writes code that is structured, both in organization and syntax, similarly. On the one hand, you have consistency which if nothing else is pleasing from an architecture standpoint. On the other you have consistency, which makes it easier for your teammates to claim ignorance of bugs and pawn the work off on you and simultaneously more difficult for one to deny authorship of said code. At least we have source control for that....right? Title: I see now why you choose not to comment your code. Snarky: Yes it looks like something I'd write, but it's not mine. You'll just have to go ahead and fix that bug.